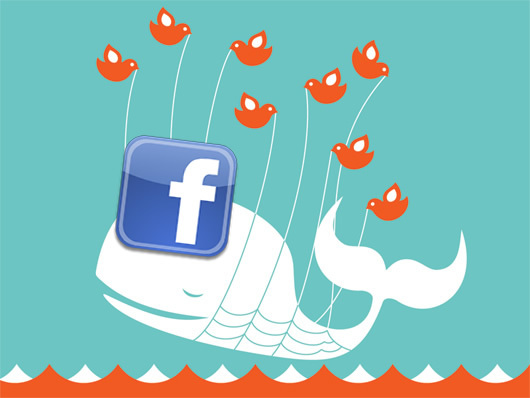 How Facebook forced me to become a Twitter user. Okay, well I officiallly twatted my first tweet over a year ago, but I’ve made it pretty clear that I’m not fond of the phenomenon. While I have warmed up to it as a means of syndicating information–we are integrating the Twitter API into the news controller in Architeck–it still seems shallow as social networking goes. (But then, “Shallow is the new two-oh,” so I’ve been told.) Twitter’s biggest users? Celebrities who like to hear themselves speak, old media news networks who aren’t even listening, and technophiles who–lets face it–are members on EVERY social networking site, and practically every free service on the Internet. So, while @thomshouse has been around for a while, I’ve never had any desire to be an active user on Twitter. Until now. And it’s all Facebook’s fault. See… I don’t want to walk down the street holding hands with Twitter, but I do want to maintain a presence. Why? I dunno. I suppose I too like to hear myself speak. Or perhaps I would like to have some content there, on the off chance that Twitter might become a major avenue of communication for me–say, because of a side project or freelance work. I’m definitely a technophile, so that weird obsessive craving to tinker with everything is there, too. But most of all I want to maintain a presence on Twitter because it should be effortless. With social APIs left and right, I should be able to post my status on Facebook and see it updated on Twitter, FriendFeed, MySpace–everywhere. And that’s what I’ve been doing. I update my status in Facebook, and through a roundabout process provided by a Facebook app called “Twitter Updater”, I’ve been able to see my status updates in Twitter, usually with less than a minute’s delay. Until today. Today I updated my FB status on my iPod, jumped into Tweetie to make sure it took, and… nothing. Checked again a few minutes later, and still no update. Numerous posts have since appeared from the people I follow, and meanwhile, crickets chirp over my lack of an update. I grew suspicious. Logged into FB to investigate, and sure enough, the powers that be disabled Twitter Updater’s ability to function. A little background: Facebook doesn’t make it easy to share your status with other services. As I understand it, Facebook’s APIs expose the ability to update your status, but not to read it. It would seem that applications used to have this ability, but it has since been disabled. Twitter Updater got around this “shortcoming” (or crippleware?) by having you add a bogus friend–in my case, a Mister “Twitter Updater II”–to your friends list. The application couldn’t read your status, but your friend T.U. sure could, and voila! Twitter updates via Facebook. At least, that’s how it did work. Now, Facebook has disabled the friend accounts, supposedly on the basis that they “do not represent real people”. They have also completely obfuscated access to your private “mini-feed”, an RSS file that can provide another means of export. I believe, however, that this–and all other means to cut off access to Facebook status updates–is a result of (Facebook founder) Mark Zuckerberg’s love/hate relationship with Twitter. Those that follow tech news probably know that Zuck was infatuated with Twitter as of last fall, that Facebook attempted to acquire Twitter with a $500 million stock deal, and that Twitter turned it down. And Facebook users are all-too-aware of the much-maligned changes made to the home page recently, changes that seem designed to suspiciously resemble a Twitter-like functionality. It seems to me that this crackdown on API status access and on services like Twitter Updater are just another piece of the puzzle. There is no justifiable reason for Facebook to lock down status access. Applications can already be granted access to your name, friends list, birthday, and who knows what else from your profile. And if there’s anything Facebook’s done spectacularly, it is the detail and granularity of privacy controls to block or allow applications access to this information. So it can’t possibly be a privacy concern. No, it’s got to be a business model. Facebook is blocking access to the status to prevent an exodus, or perhaps just to spite the competing service. Mark Zuckerberg is the jealous, possessive lover: if he can’t have Twitter, no one can have Twitter. What legitimate reason is there to cut off access to status updates? Won’t this move actually hurt Facebook? I like Facebook. I’m a UI snob, and I prefer its aesthetic. I would much prefer to use Facebook and be able to ignore Twitter altogether. Is it really better for Facebook that I am now forced to “reverse the flow”, to update Twitter and spend less time directly on Facebook? Because that’s what I’m doing now. I am updating from Twitter, and using Facebook less often than I used to. Good business model, FB. Anyone who feels my pain or likes this article can follow me @thomshouse. I’ll be on there a lot now, it seems! 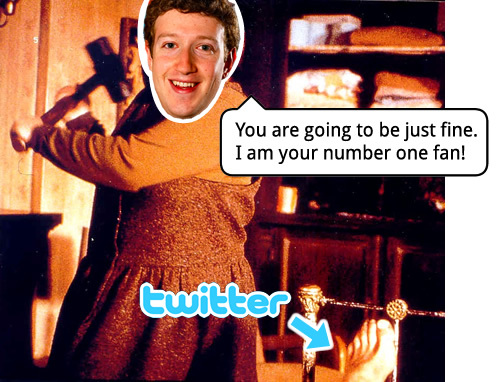 5 Responses to How Facebook forced me to become a Twitter user. submit this to digg. I love this rant, and the zuckerburg photo. Chris here – I’m the developer of the Twitter Updater application. Really enjoyed your post, but just thought I’d set you a little straighter on a minor point. Facebook’s limited API really is a frustration, especially for someone like me (or yourself) who has an interest in integration with other similar micropublishing services out there. However, this doesn’t exactly help the problem of Twitter Updater needing a ‘robot’ FB account to collect status messages. This is because of scalability – when the number of people using the service grows past a few hundred, the number of API requests becomes unreasonable; more bandwidth and processing power would need to be added for each user that signs up. The friend status RSS feed belonging to the Twitter bots solved this problem very effectively – a single feed could be polled on a regular basis, aggregating all the users’ updates together. I’ve been trying hard to contact Facebook, to try convince them to make an exception to their policy in the case of the Twitter bots, and re-enable the accounts. One of them (now known as Joe Twitterbot) has been resurrected, but they won’t bring back Twitter Updater II because of their one-account-per-person restriction. Hi Chris. Nice to hear that there is at least some API functionality to accomplish this feat, although it’s a bit disappointing to hear of the technological hurdles. I’ve never looked deep into what Facebook allows for application development, but it would make more sense if they offered some sort of “push” method to this API… Something like, when you update your status, Facebook somehow “pings” the applications that have access to read your status. One could wish. I appreciate you dropping a line and I hope that, however they accomplish it, Facebook will start to embrace us proxy-Twitterers. Hi Chris, Great rant…sums us how many of us feel. I too find myself on twitter way more often now because of FB. Which means less time on FB…. I wish they would figure that out.